LAKE FOREST, Ill. (AP) — Coach Matt Nagy insisted Jordan Howard remains a big part of Chicago’s offense and the star running back was adamant he wasn’t frustrated despite a limited role in the most recent victory. As good as that sounds for Chicago, something else stood out: Howard’s small role. He carried 11 times for 25 yards and was in on 33 of 61 plays. Howard didn’t talk to reporters after that game, and players were not available to the media until Monday. With more than 2,600 yards rushing since the Bears took him in the fifth round in 2016, Howard has been one of general manager Ryan Pace’s most successful draft picks. He ran for 1,122 yards last season after finishing second in the NFL with 1,313 as a rookie. But there were also questions how he would fit in Nagy’s system after struggling in the passing game his first two seasons. Howard’s name came up in offseason trade rumors, and Bears-related photos disappeared from his Instagram account at one point, though he insisted there was nothing to it and wouldn’t acknowledge removing the pictures. Howard has shown improvement catching the ball but hasn’t found a rhythm running it. With 203 yards on 64 attempts, he is averaging 3.2 per attempt. That’s well below his career average of 4.5 yards. Howard has run the ball 15 times or less in three of the four games and hasn’t rushed for more than 82 yards this season. It’s hard to argue with what the Bears did against Tampa Bay. They saw an opening against a banged-up secondary and got huge games from Trubisky and Cohen, even if it meant a light day for Howard. That’s something they probably couldn’t have done last season. But the Bears brought in more play-making pass catchers and hired an offense-minded coach after firing John Fox. They have more options now and don’t necessarily need to rely on the run as much. NOTES: WR Anthony Miller (shoulder) and CB Prince Amukamara (hamstring) did light work at practice. Both players sat out the Tampa Bay game. 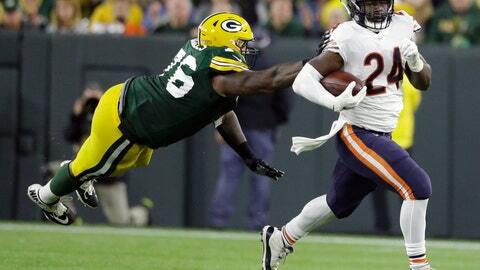 … The Bears placed LB Sam Acho (torn pectoral muscle) on injured reserve and signed OL Bryan Witzmann.